Saute bacon, then dice it. Save the grease. Sear pork chunks in bacon fat. Dump all ingredients in a pot, submerge in chicken stock. Cover and simmer at low heat for 120mins, or until tender enough to pull apart with a fork. Then go screw around for a while. 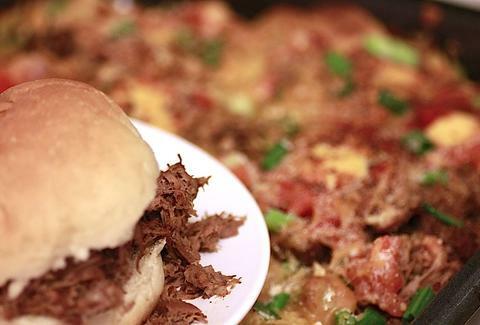 Strain the pork, pull it, and pile it high on nachos, sliders, or whatever else you like.